Science and innovation for everyone. Water rocket science, adventure and fun. Educate your scouts, students or kids while having tremendous fun. We started designing water rocket launch pads in 1997. The basic requirements were to have an easy to use, low cost, launch pad for an engineering class. The launch pad uses an end seal (not an internal O-ring) and holds the bottle down until you are ready to release it. The locking mechanism is loosely based on a suitcase latch. Careful arangement of the PVC parts (mostly off the shelf) makes it a strong, spring loaded, latch that won't release the rocket until you say so. Our launch pads use ordinary soda bottles, or pop bottles, for scouts, schools or hobby. Just add air and water/H2O. We are not just about selling launch pads. We promote good rocket science, safety, scouting activites, and fun using air pressure and water. No combustable materials! New Website For Mobile Devices. Click this link if you were not automatically forwarded. Working hard to make the site better and easier to read. You do not need a mobile device to see the new content. Take a look, send feedback, enjoy the new science summary. 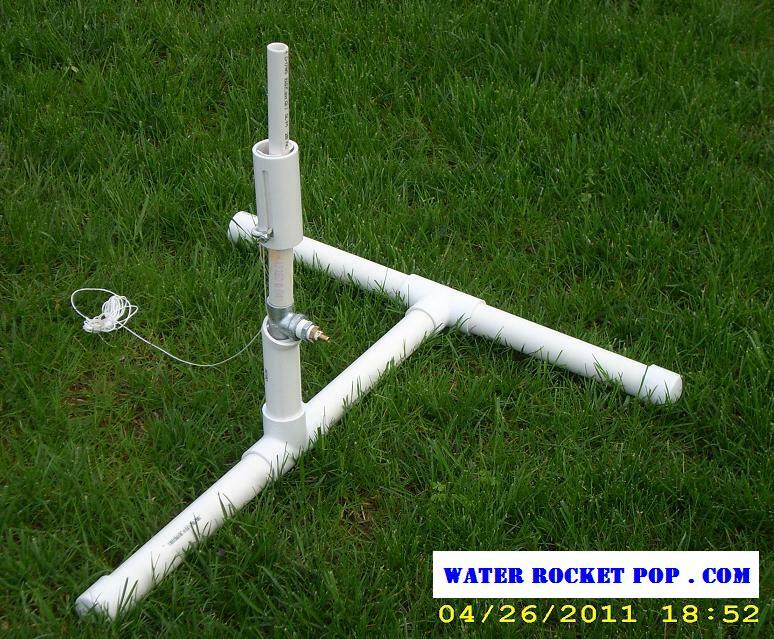 From the engineer of WaterRocketPop.com comes a new launch pad. It combines molded grabbers, internal O-Ring seal, and a new soda bottle reaming tool to make one easy to use rocket launching experience. The internal O-Ring seals are known for being difficult to mount soda bottle rockets. Not a problem any more. Use the new bottle reaming tool, one free with every launch pad purchased, and the larger diameter soda bottle throat with it's taper will now go over the O-Ring with very little effort. You can also purchase the reaming tool seperately. The new launch pad uses a sliding collar to lock the bottle in place. There is a new spring return to ensure the rocket stays locked in until you pull the string. One of the best changes to the launch pad is the use of metal galvanized pipe. Durable, strong, easier to maintain, if you need to. The whole pad can be dissassembled and reassembled using only teflon tape to seal the threads. Because the launch pad owners can break-down and reassemble the launch pad, we now offer different launch tubes with O-Rings ready for many sizes of bottles. You can even specify a length (within reason) for your really tall rockets. We didn't stop at the launch pad. We now sell FTC (flourescent light tube cover) molded ends. These come ready to glue onto your FTC tubes so you can construct your rockets knowing you'll have a good pressure containment. Come back soon and see other additions to the WaterRocketPop.com website. The 7th Annual Cub Scout Water Rocket Derby was held in Santa Clara California. So many scouts participated and blasted into history. See Photos Here. Wow! Can they really do that? U.S. Water Rockets' X-12 Water Rocket continues to push the envelope of Water Rocketry with unbelievable flights passing both the 2,000 foot and 600 meter milestones during new World Record setting averaged flights of 2,044 feet (623 meters). X-12 has become the first Water Rocket to ever cross both of these milestone heights. 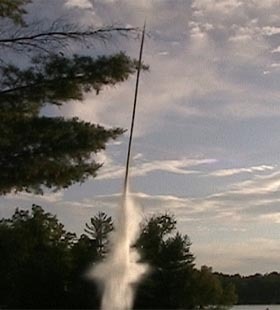 Special thanks to U.S. Water Rockets for permission to use photo. Send in your photos and stories. We love to hear about your adventures. Adding more content all the time. Come back often. NEW content on the construction page. Uploaded video too! Water Rocket Car and Squirt Gun. Construction Page. NEW SCIENCE LINK TO NASA. REALLY GOOD PAGES! See the top of the Science page. If you have any difficulties we want to hear about it. We have been through several redesigns. We've eliminating parts, made it easier to manufacture, dropped costs, and made it easier to repair. The latest design from the fall of 2006 was 2 years prototyping and testing. Seltzer Rockets instructions are here! See the link on Rocket Construction page. ADDED PARTS TO THE ORDERING PAGE! Get parts to assist with your own launch pad. Check back soon because we'll be adding more parts. 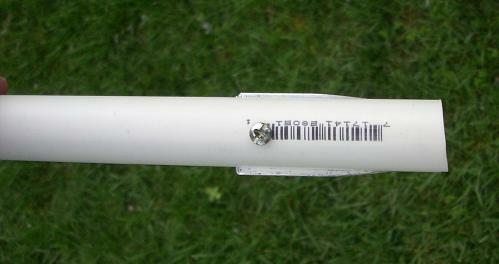 Water Rocket Scence List: A.W.A.R.S. "Actually We Are Rocket Scientists"
There are more people promoting water rocket science and we want to help you get connected. See our Links.